Rock of Angels, the stone monument behind St John's Episcopal Church, has been moved. The monument honoring those killed on 12/14 was relocated on Wednesday from Sandy Hook to a therapeutic horse farm in Bristol. 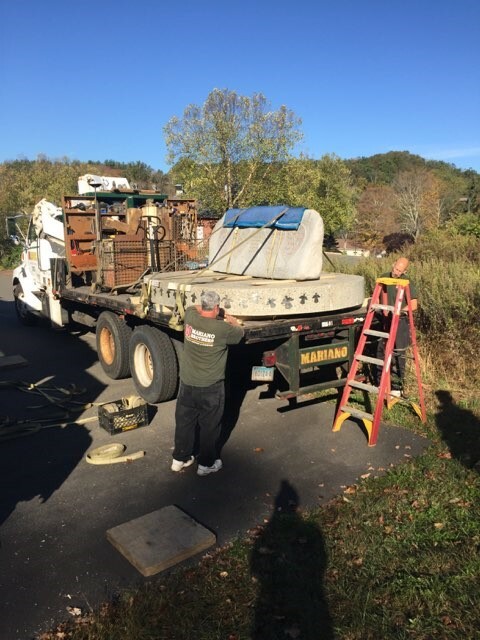 A crew from Mariano Brothers moving was on site for just a few hours early October 18, dismantling the monument and then loading it onto a flatbed truck for transport. A pair of wooden benches, while not part of Wednesday's relocation, will also be moved to Bristol. The effort was necessitated by the closing last year of the church at 5 Washington Avenue. The future of the monument, and its care, went into question almost immediately. In addition to determining what would happen with the property and building, The Episcopal Church of Connecticut (ECCT) also began working on what would happen to Rock of Angels last year, according to The Reverend Timothy Hodapp, canon for mission collaboration for ECCT. "We spent a lot of time searching for a place close to Sandy Hook, including civic and religious organizations with Newtown and beyond," Rev Hodapp said via e-mail, October 18. "Finding no one with interest in receiving the monument, we chose a site that could accommodate the memorial and visitors, in a beautiful setting, and at a place dedicated to the healing of children and adults." There was active outreach by the diocese to Newtown's other houses of worship, Rev Hodapp said. Those efforts were "to no avail," however. "Monuments are frequently placed in areas other than at or near the particular site where an event occurred and that the memorial honors," he pointed out. "Placing the Rock of Angels in an appropriate setting for the public to visit was, in our opinion, a better option than placing it in storage." Rock of Angels has been moved to the diocesan property in Bristol, on 23 acres of woodland and trails that surround Shepard Meadows Therapeutic Riding Center. Shepard Meadows provides services for children, youth, adults, and veterans. The property on which the monument had been located in Sandy Hook, owned by the Episcopal Church in Connecticut, is being sold to a private buyer. While Rev Hodapp was unable to reveal the confidences of any conversations between ECCT and the potential purchaser of 5 Washington Avenue, he was able to say this week that "there is a great respect and sensitivity on the part of the purchaser, both for the former parish as well as its proximity to the Sandy Hook Elementary School." "One faithful man's response, in building this memorial to those who died, was placed at St John's in 2013 as a place for people to go to remember, to pray for God's healing, and to feel God's call to share God's love," Rt Rev Ahrens Laura J. Ahrens, bishop suffragan of the Episcopal Church in Connecticut said, October 16. "With the closing of St John's, we have moved this to a place whose ministry is all about embracing healing and new life." Cheryl Moulthrop, whose family worshiped at St John's for generations, was part of the group that helped Rock of Angels find its way to Sandy Hook. She and her husband, Bruce, who served as warden for the church for years, were among those trying to find a new home for the monument since the closing of the church last autumn. 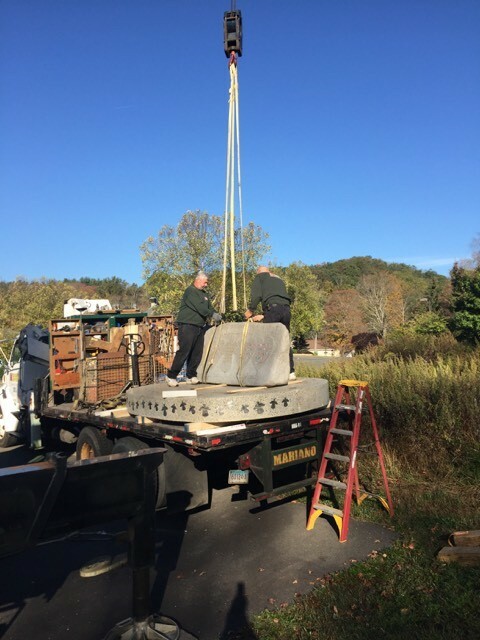 "Basically they've already got a closing date set for the buyer, so they need to expedite moving the stone," Mrs Moulthrop said October 13. "I don't think anybody else is going to come forward," Mrs Moulthrop also said Friday afternoon. "It's been very well known all around town that the status of the memorial was up in the air." Almost immediately after the shootings in December 2012, gifts of all sizes began arriving in town. The Town of Newtown had tried to get the message out to those offering gifts and suggestions in the wake of 12/14: hold on to your plans and suggestions, and do not send large items. A permanent memorial design, creation, and placement would be all decided upon by a formal commission. Rock of Angels has been a pressure point. While many have found comfort in visiting the memorial, including countless visitors from out of town who arrive specifically to pay their respects, others have not been so fast to embrace it. The angels depicted on the monument draw religious connotations for many. In addition, none of the families directly affected by 12/14 were consulted during the design of Rock of Angels, another drawback for any permanent memorial. The monument had been envisioned by Florida resident Richard Gray. Working with a craftsman in Maine, and other supporters, Mr Gray created the several-ton granite memorial monument to the 26 children and educators killed on 12/14. The monument features six hearts and an angel carved across the front of the monument. The names of the children killed are within the hearts, two on either side of the angel. The names of the six educators killed that day have been carved within the outline of the angel. "I think the monument is a striking work of art that attempts to capture, combining impressive stone and etchings, a symbolic representation of the souls lost on December 14, 2012," Rev Hodapp said this week. "It is worthy of respect and deserves a place of honor, which is what we hope and pray ECCT has provided," he said. A small group of local residents felt a strong pull to the proposed memorial and embraced Mr Gray when he started posting about it in early 2013. With support from Father Mark Moore, then-pastor of St John's Church, congregants of St John's and a few others arranged for the monument to be placed behind the Washington Avenue church in August 2013. Three years later, St John's Church closed, and that put the future of the monument in limbo. The diocese and the Town of Newtown had many discussions about Rock of Angels, Rev Hodapp said. "Ideally we would have preferred that the monument remain where it was originally installed," he said October 18. "St John's' vestry - governing board - in one of its final votes, resolved to give the parcel of land and monument to the Town of Newtown." The Board of Selectmen discussed Rock of Angels at a number of meetings. First Selectman Pat Llodra reminded the Board of Selectmen late last year that the arrival of the monument was not supported by the town. Future use of the land could be hampered by the monument's presence, the selectmen had decided by December. 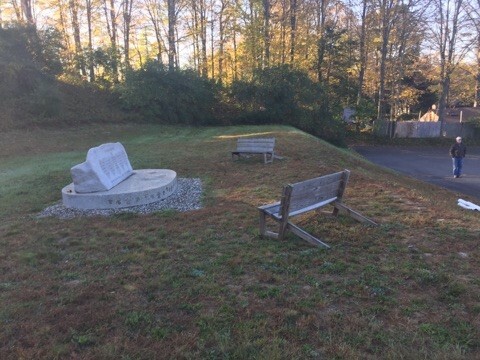 In February, Mrs Llodra and the selectmen again discussed the Rock, saying in part that it was not considered an officially sanctioned town memorial. The Sandy Hook Permanent Memorial Commission (SHPMC) has also had, since its inception, a goal of having only one permanent memorial in town. Tasked with finding a location and ultimately accepting a design for the formal memorial to 12/14, the SHPMC voted in February 7-1 against taking Rock of Angels under its purview. Rev Hodapp is satisfied with the new home for Rock of Angels. He is pleased, he said Wednesday, "with the new site and our option to keep the monument within public view, continuing to honor the intention of the original donor to remember the children and staff of Sandy Hook Elementary."